Sweet Potatoes are an incredibly nutritious food that are packed with antioxidants like beta carotene, vitamins C, E & D, and minerals such as manganese and iron. They are also high in potassium which helps to lower blood pressure by removing excess sodium and regulating fluid balance in the body. Sweet potatoes are an excellent anti-stress food and are known to help relax muscles, steady nerves, and balance cognitive function. They are also one of the best anti-cancer foods and can particularly help to prevent breast, colon, lung, skin, and oral cancers. Sweet potatoes are known for being easy to digest and are very good for ulcers, inflamed colons, digestive disorders, and constipation. Sweet potatoes contain compounds called phytochelatins that can bind to heavy metals such as lead, mercury, copper, & cadmium and safely remove them through the body. Mothers have even given children who have accidentally swallowed a metallic object such as a coin, plenty of sweet potato so that it will stick to the object and allow it to pass through easier. 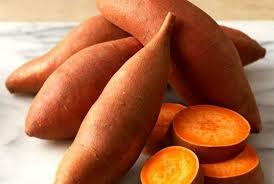 The health benefits of sweet potatoes are the most bioavailable when eaten raw, steamed, or baked. Try making a simple fat-free sweet potato soup by steaming sweet potatoes until soft and then placing in a blender or food processor and blend until creamy smooth. Spices such as cloves, cinnamon, ginger, chili pepper, or curry can be added for a flavor and nutritional boost. Baked sweet potatoes can be stored in the refrigerator and later sliced over a fresh green salad for a hearty lunch or dinner. Sweet potatoes are also delicious mashed with a drizzle of olive oil, coconut butter, or avocado. Sweet potatoes are a comforting, satisfying, and very healing food, consider finding more ways to include them into your diet.